No story about one type of aircraft could be more complete than this coverage about the B-57 Canberra. A brief history of its British inception sets the stage for the conversion that took place to American standards for production in the United States. The Canberra was needed to fill the night intruder role in the USAF that was identified during the Korean War. The B-57, did that, and far more. 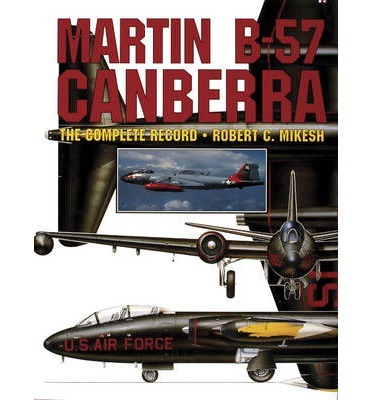 The author, who flew the B-57 over a 15-year period, covers all aspects of the 28 years of operational service of the B-57. Initially, the B-57 outfitted four combat wings in the bomber version, along with many units in the reconnaissance role. Missions changed and units faded, but the Vietnam War set the history for this remarkable airplane. It remained in combat for eight years, and many of these daring missions are covered in detail in this book. This becomes another informative reference book dealing with the lively aaspect of the Vietnam War. The book is filled with many rare action pictures of this airplane in color and black and white. The expanded appendices contain many historical points such as units and time period of assignment, production records, individual line entries for the history of each aircraft, and many more details that appeal to the airplane historian. Robert C. Mikesh had accumulated 2,000 hours in flying the B-57 Canberra, beginning with the first USAF unit to receive the bomber version. Enamored from the very beginning with this airplane, the thought of one day writing a book about the B-57 inspired him to gather detailed notes over the years while the airplane was operational. This brings to life this airplane story that could not be compiled any other way than through this first hand experience. Mikesh served a 21-year career in the USAF as a pilot, having spent much of this time in the Far East. During the Korean War he flew a tour in Douglas B-26 night intruder missions over North Korea, and during the Vietnam War he was a Forward Air Controller in the Cessna 0-2A, directing air strikes, many being his comrades in B-57s. After retiring from the Air Force in 1970, Mikesh joined the National Air and Space Museum as curator. He became responsible for managing the world's foremost collection of historic aircraft. This not only included locating and gathering historic and technologically significant aircraft and acquisitions, but overseeing their restoration as well. Now retired from NASM as of 1991, Mikesh devotes much of his time to aviation writing and consulting work for museums and aircraft restorers.